In these Hubble photos, the core of M87 is located at lower left in the images. HST-1 is the bright blob at center. The glowing material at far right is part of a stream of particles in the jet that speed up and glow in the ultraviolet. The photos show show the jet growing brighter over a seven-year period. A jet of gas spewing from a huge black hole has mysteriouslybrightened, flaring to 90 times its normal glow. For seven years the Hubble Space Telescope has been watchingthe jet, which pours out of the supermassiveblack hole in the center of the M87 galaxy. It has photographed the strangephenomenon fading and then brightening, with a peak that even outshines M87'sbrilliant core. Scientists have dubbed the enigmatic bright blob HST-1, andare so far at a loss to explain its weird behavior. "I did not expect the jet in M87 or any other jetpowered by accretiononto a black hole to increase in brightness in the way that this jetdoes," said astronomer Juan Madrid of McMaster University in Hamilton,Ontario, who conducted the Hubble study. "It grew 90 times brighter thannormal. But the question is, does this happen to every single jet or activenucleus, or are we seeing some odd behavior from M87?" Many supermassive black holes have jetsof material that spray out perpendicularly from the donut-shaped ring ofmatter falling onto the black hole. These beams of hot gas are thought toresult from magneticfield lines that are twisted by the black hole's mass, and propel chargedparticles outward. To learn more about this bizarre light show, Madrid analyzedthe seven years' worth of Hubble images of the jet in ultraviolet light tocapture changes in HST-1's behavior over time. He also compared the Hubble datato photos of the jet taken in X-rays by the Chandra X-ray Observatory and inradio by other telescopes. Madrid found that between 1999 and 2005, the blobcontinually brightened. 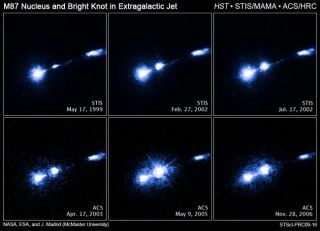 By May 2005, HST-1 was 90 times brighter than it was in1999. After that, it seemed to fade, and then intensified again in November2006. "By watching the outburst over several years, I wasable to follow the brightness and see the evolution of the flare overtime," Madrid says. "We are lucky to have telescopes like Hubble andChandra, because without them we would see the increase in brightness in thecore of M87, but we would not know where it was coming from." More data will be needed to solve the mystery of why HST-1acts the way it does. "We hope the observations will yield some theories thatwill give us some good explanations as to the mechanism that is causing theflaring," Madrid says. "Astronomers would like to know if this is anintrinsic instability of the jet when it plows its way out of the galaxy, or ifit is something else." This strange case could provide a unique opportunity tolearn more about black hole jets in distant galaxies, which are difficult tostudy because they are so far away. M87 is located 54 million light-years awayin the Virgo Cluster. Madrid's study is detailed in the April 2009 issue of the AstronomicalJournal.